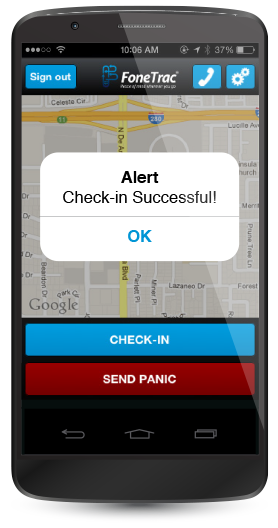 Panic alarm: Sends date, time and location data to the GlobalSecur Command Center to initiate rapid worldwide assistance. Panic alerts are also sent to designated cell phones and email addresses to provide immediate notification to appropriate personnel. Check-In: Travelers can update their current location as often as desired with a simple Check-In button. Travelers can be reminded by email to check in daily based on their travel itineraries and can even designate one person to receive notifications via email whenever they Check-In. Global Monitoring: Destination locations are monitored and travelers can be alerted when an event occurs that could affect them. Easy to use: No additional equipment is necessary. Just download the app and it can be used anywhere there is a cell signal or Wi-Fi hotspot. Messages can also be sent via SMS in low coverage areas. FoneTrac® can even work on tablets, notepads and laptops. Each user is allowed to designate one person to receive an email notification whenever they Check-In. This notification provides the name of the user, date and time of Check-In, location at the time of Check-In, and a link to Google Maps that will display their location. Emergency Contact must have at least one phone number. Phone not included. Monthly / Yearly prices are per person.